Radiographs (x-rays) are extremely helpful for diagnosing and monitoring many medical and surgical conditions in your pet. X-rays are useful for assessing your pet's bones, lungs, heart, abdomen, oral cavity, and other areas of the body. If a lump or growth is found on your pet during an examination, x-rays can often determine the size, shape, and location of the mass. An x-ray can spot a fractured bone, detect bladder stones, help with the diagnosis of heartworm disease, or locate an obstruction or foreign body (a bone, toy, or piece of clothing) in your pet's intestine or stomach. X-rays are also useful for diagnosing heart and lung problems and can be used to evaluate hip and elbow dysplasia in dogs. Attleboro Veterinary Clinic's x-ray machine produces high quality radiographs, allowing our doctors to diagnose your pet's medical condition quickly and accurately. 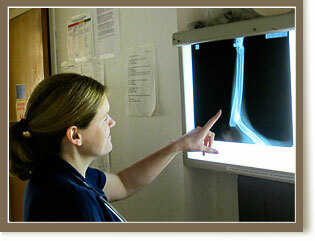 In some cases, if we deem necessary, we will send your pet's x-rays out to a specialist for further analysis. Ultrasound is a pain free, non-invasive procedure that uses high-frequency sound waves to produce a real-time moving image of your pet's internal organs. Ultrasound is painless and does not require anesthesia or sedation in most cases. This exam is typically performed after blood tests, x-rays, and a physical examination indicates an underlying problem. Ultrasound allows our Attleboro veterinarians to see things that cannot be visualized with radiographs. For example, an x-ray of your pet's abdomen may show enlargement of the liver but does not tell us why it is enlarged. An ultrasound is a complimentary test that allows us to see the structure of the liver in greater detail and identify specific lesions or masses. An echocardiogram is an ultrasound of the heart, and an important diagnostic test in assessing animals with heart disease and developing a treatment plan. We offer cardiac, thoracic, and abdominal ultrasounds for your pet.